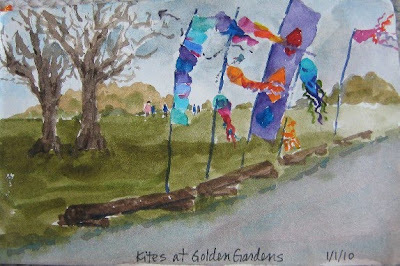 On New Year's Day, we love to go to Golden Gardens Park, where the Kite Association gathers and flies kites. This year was very cold, rainy and blustery -- so much so that I finished my sketches at home. Another Seattle New Year's Day tradition: burning Christmas trees on the beach. Golden Gardens Park is a salt-water beach on Puget Sound, about 5 miles north of downtown. The park provides burn pits, picnic tables, invigorating beach hike and fantastic vistas. Glad you finished them! Kites are delightful - I can feel the breeze! These are wonderful with color, really give the feeling of the weather and day! I love how the color of the kites just pop out of the painting. What a great focus to the image.